Overcome stress. Online guide.Overcome stress. Online guide. “To keep the body in good health is a duty... otherwise we shall not be able to keep our mind strong and clear”. Our body is a complex system that can’t function properly if one of its components crashes. Most of the time, we have no idea about the limits each body can stand and exhaust it to the maximum until we feel something wrong with us. Naturally, we believe that feeling good physically is enough to go through our daily difficulties, but what if it comes to that point you start to admit to yourself something is wrong with you? This could include the following symptoms: frustration and arrogance when with other people, refuse to talk with anybody, acknowledge everything as negative even when positive, insomnia and mild to high levels of depression. If you encounter any of the listed symptoms, then your experiencing the first stages of mental stress. From this point on we start look for the reasons why it happens to us and the ways to overcome this feeling. If being healthy is your primary concern as well then let’s take a look at the main features of stress and the best tips to cope with it. "Being in control of your life and having realistic expectations about your day-to-day challenges are the keys to stress management, which is perhaps the most important ingredient to living a happy, healthy and rewarding life"
In fact, stress is a reaction of the body caused by an unusual situation that goes beyond what is usual to us. This is the stage when the mind loses its ability to move towards its goal. A stressed person loses their purpose in life as loses the vital thread as well. Our mind inspires the whole psyche to sustain life and function and as a result of the fact that the purpose of the person disappears, the whole psyche simply collapses. Eventually, we cannot figure out what to do next and become discouraged. Being stressed under favorable condition can be transformed into optimal condition and under unfavorable, in a state of nervous, emotional tension, which is characterized by reduced efficiency and effectiveness of the systems and organs leads to depletion of energy resources. (Check a great test to determine your stress vulnerability). As was mentioned before stress is a response of the body to a change. 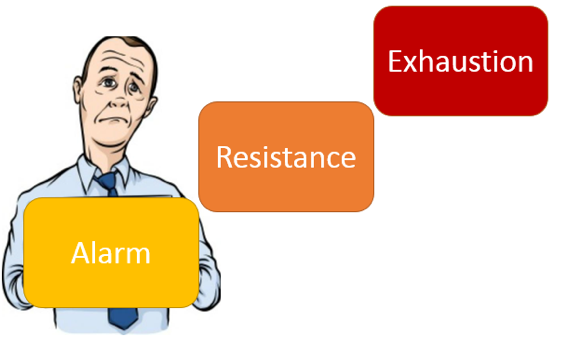 Depending on a measure of change we are going through three stages of stress: alarm, resistance and exhaustion (Pic 1). In the alarm stage we are exposed to some kind of stress or stressor and our body responds two ways. First, the sympathetic nervous system releases catecholamine. 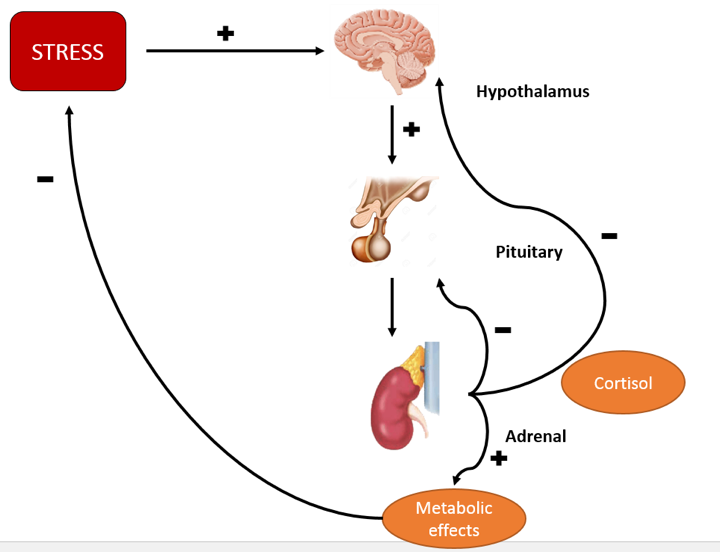 Secondly, the adrenal glands of the HPA axis release cortisol. This is our body’s preparation to deal with the stress (Pic. 2). But long term exposure to cortisol compromises our immune function. Therefore, our body can't handle being in the alarm stage too long, we either die or we cope. And if we cope, we enter stage two, called resistance. In resistance, cortisol is still being released throughout our body and it helps to activate us, arouses us and maintains a response. Now, we reach the third final stage - exhaustion. And in this stage our body trying to fight with this threat for such a long time that we've become depleted of its resources. We start to lose the ability to fight off illness because our immune system is compromised. “You're in pretty good shape for the shape you are in”. The best way to start controlling the stress is to enter a situation with a clear plan for dealing with the stressors. So, do not be afraid of stress, the danger is not in the stress itself but in the inability to cope with it. 1. Do not deny the change. Try again or try something new that usually improves the situation. 2. Identify your stressors and learn to recognize your reactions to them. By learning this you will know how to avoid the sources of stress in the future. 3. Write down all your responsibilities, daily tasks and underline the critical items that make you feel most under pressure. 4. Try to organize your day with a balanced workload. 5. Take a quiet time for yourself during the day. 6. Exclude alcohol, cigarettes, coffee, energy drinks, drugs and other stimulators. 7. Think about what would make you feel better, i.e. (super tasty dessert, trip to Thailand or awesome body massage). 8. Connect with the people around you: family, friends. Tell them about your feelings. 9. Find the activity that you enjoy (language courses, reading books, horse riding, swimming, embroidery or beading etc.) Put a small beneficial goal in the activity you choose so, you can enjoy the process and receive positive energy from it. 10. Exercise! Physical activity is the best way to release stress and refresh your mind. Start to love your body and wellness is guaranteed. 11. Use breathing relaxation techniques or start to attend yoga classes. 12. More sleep should be a #1 rule in your schedule. This is a great healer from tension. 13. Eat well and take vitamins. More fruits and green veggies. 14. Take a walk. Walking for 40 minutes a day seemed to increase the size of people's brains according to the recent studies in England. 15. Short (week) vacation away from all the worries will be a great benefit if you feel fatigue and irritated. 12 effects of chronic stress – how the chronic stress affects your brain. Helping kids cope with stress – tips. Stress resistance quiz – find out how stress resistant you are.